Top 7 Most Expensive Design Furniture | What is it worth? Modern design is a rising department in auctions worldwide. Artistic quality and uniqueness of a piece of furniture can fetch astronomical prices we see only at fine art auctions. 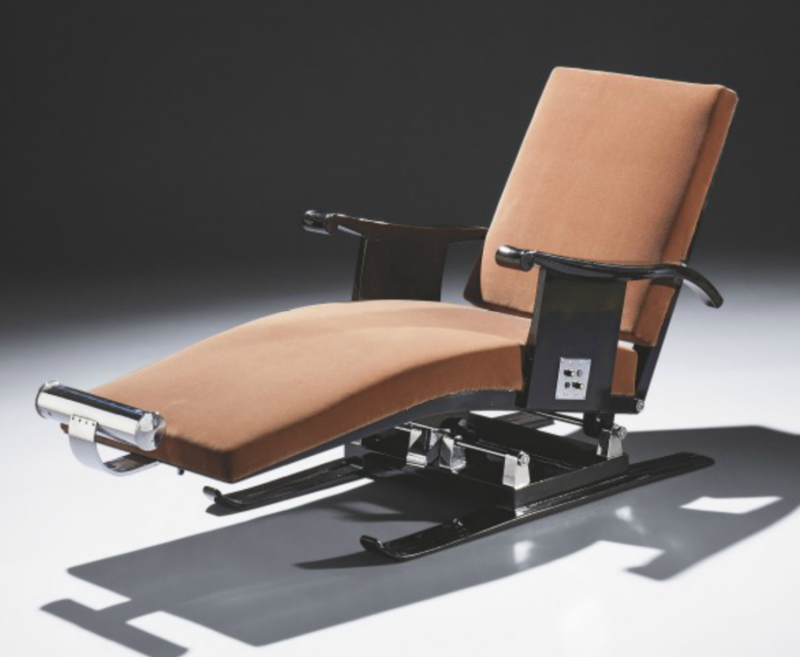 For curious minds, we have listed 5 most expensive design furniture ever sold at an auction. Scroll down for number 1! 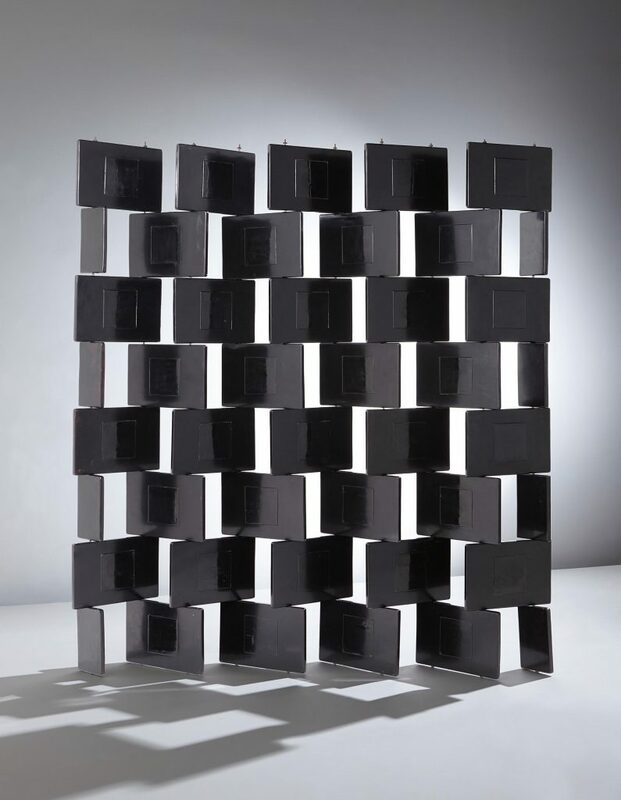 Eileen Gray, Folding ‘Brick’ screen, c. 1925. Black lacquered wood, steel, brass. Sold for £1,482,500 at Phillips. Photo courtesy of Phillips. Eileen Gray designed this screen for her lover, Romanian architect Jean Badovici‘s apartment in Paris. Unique in its arrangement and design and among the largest screens by Grey, this lot features thirty-six full bricks with raised panels on either side and eight half-bricks, all forty-four of which are held together by threaded mild steel rods surmounted by domed brass spanner nuts of the same design as those on Gray’s “Transat” chair (circa 1926-1930), also owned by Badovici. Gray’s lacquered ‘Brick’ screens of the 1920s abandoned Art Deco’s burly ornamentation and volumetric curves in favour of stricter geometry of modern design, although Grey always avoided to be consumed by only one style. “Brick” screens are in the permanent collections of the National Museum of Ireland, Dublin; The Museum of Modern Art, New York; the Virginia Museum of Fine Arts, Richmond; and the Victoria and Albert Museum, London. Only a maximum of 10 Brick Screens by Grey exist in the world. 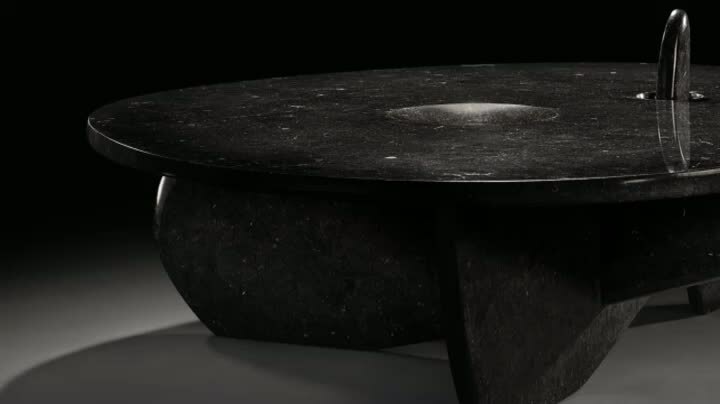 Isamu Noguchi (1904-1988) , Unique table, fossil marble, 1948-49. Sold for USD 2,882,500 at Christie’s New York in June 2012. Photo courtesy of Christie’s. Noguchi once said “Everything is Sculpture. Any material, any idea without hindrance born into space, I consider sculpture.” One of two Isamu Noguchi tables on this list, this unique sculptural table was custom designed for Mr. and Mrs. Samuel C. Dretzin, in 1948-49, and stayed in their home until its first appearance at an auction, in 2012 Christie’s New York. One of Isamu Noguchi’s rare private design commissions, this sublime table defies the pragmatic constraints of mere furniture, on the fine line between fine art and design. It is like a sculpture you can have dinner on! The Dretzkins placed the softly carved and polished fossil marble table in their summer house in Chappaqua, NY, alongside with works by Georgia O’Keefe and Henry Moore. 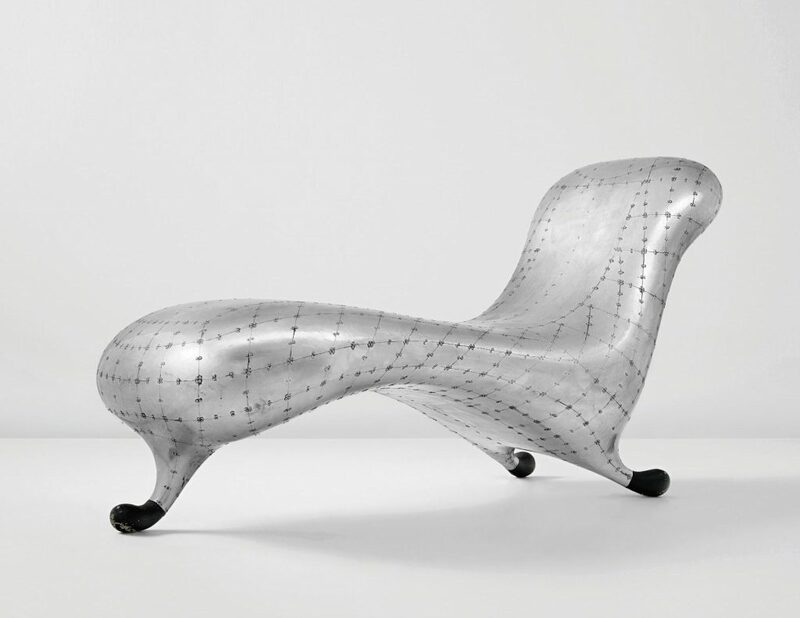 Marc Newson, Lockheed Lounge, c. 1990, sold for £2,434,500 in April 2015 at Phillips. Photo courtesy of Phillips. European furniture design of the 1980s was characterised by two extremes: on the one hand the flamboyant post-modern style of Ettore Sottsass and Milan’s Memphis group; on the other the punk-inspired ‘creative salvage’ spirit of Ron Arad and Tom Dixon, who forged ahead with found or industrialised materials. Although he was a world away in Australia, Marc Newson was neither unaware nor immune from these divergent styles. In that context, his iconic “Lockheed Lounge” can be read as both sleek and flamboyant while also evocative of a punk Mad Max approach to futurism. The fourth lot on our list is the “Ski” Chaise by famous French Art Deco designer Emile-Jacques Ruhlmann. This somewhat quirky piece is a one off production might strike as a dentist chair at first. But it is designed to make the sitter weightlessly comfortable. The curved legrest and perfectly angled back are covered with brown velvet. The chair is equipped with 4 buttons to adjust the position, which was a technological wonder for 1929. The chaise is fitted on a pair of skis, which form the legs and give the design its name. Possibly commissioned by the Maharajah of Indore, this chaise lounge is more modern compared to Ruhlmann’s other designs -normally featuring tropical wood and ivory ornaments- and exhibits an interesting twist in his career. 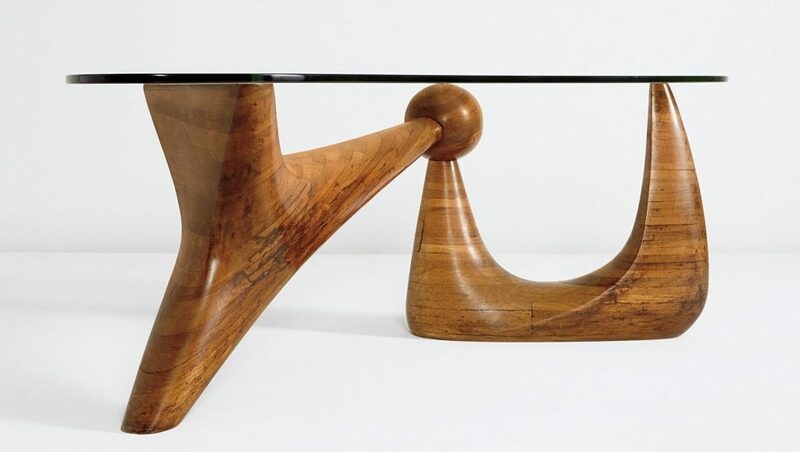 Isamu Noguchi, The Goodyear Table, Stack-laminated rosewood, original Herculite plate glass, for A. Conger Goodyear, Old Westbury, New York, 1939, Sold for $4,450,50 in December 2014 at Phillips. Photo courtesy of Phillips. After nearly two decades spent producing figurative works in bronze and terracotta, and more specifically a long series of commercially successful portrait sculptures, Isamu Noguchi boldly returned to abstraction with this design in 1939. Commissioned by A. Conger Goodyear, President of the Museum of Modern Art, this piece of art furniture was Noguchi’s first table, and the start of his famous series of abstract works, including his famous “interlocking” sculptures. This late Art Deco treasure with an opalescent gleam, made by Jean-Michel Frank sold for € 3,681,500, much greater than its humble price estimate € 400,000 — 600,000, at Sotheby’s Paris. Featuring gypsum panels set in a solid bronze frame, this design embodies Frank’s style perfectly. Jean-Michel Frank is a rare genius who could combine flamboyant Art Deco with absolute minimalism. His choice of material was also unconventional. Gypsum is a mineral that comes to life by absorbing salt water, which results in a flaky, crystalline appearance with a chalky, neutral colour. It becomes plaster when it’s demineralized. 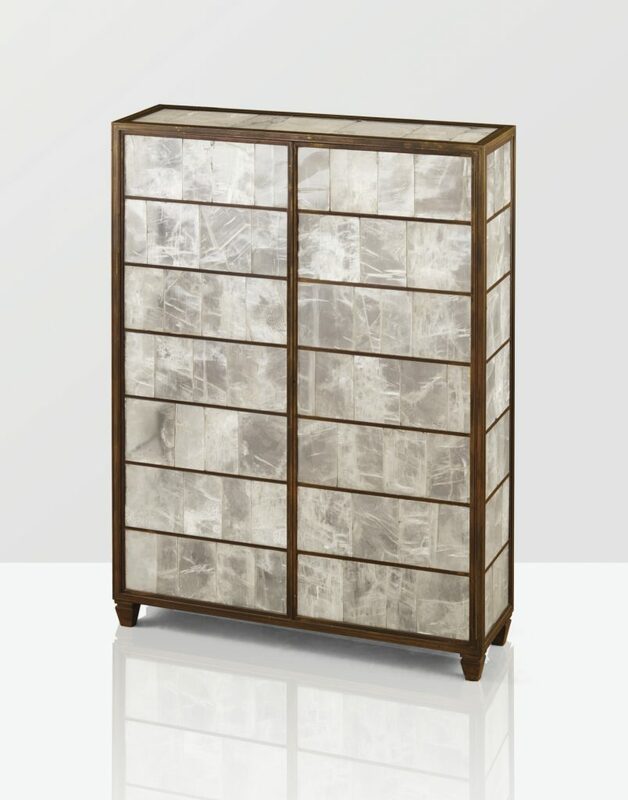 However in this design, it looks like a material between mother of pearl and ivory. This cabinet is the only piece of gypsum furniture known – an enthralling example of design simplicity and minimalist chic, in line with Frank’s ambition to produce “luxury from nothing.” It stands as an early example of the theory “Less is more” and for an exciting period in art history when designers were experimenting both with new forms and materials. This cabinet by Frank also stands for a nostalgic adhesion to the glamour of the old world, in 1935 when industrial materials and extreme modernism was taking over the design scene, either with cold tubular steel or warm plywood, but always extreme functionalism and humanism. Perhaps Frank wanted to resist that. And always appreciating luxury, the Paris crowd loved it when it was first exhibited to the public in 1936, at the Galerie Art et Industrie, Formes d’aujourd’hui Exhibition. Eileen Gray (1878-1976), Fauteuil Aux Dragons, 1917-1919. Sold For € 21,905,000 at Christie’s Paris in February 2009. Photo courtesy of Christie’s. If you are sitting down, we are ready to reveal the most expensive design furniture ever sold at an auction. 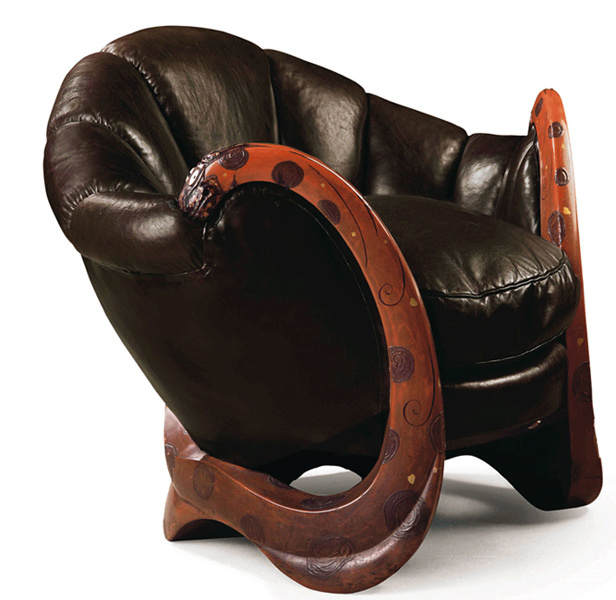 It is Eileen Gray’s Dragon Chair from 1917-1919, which sold for € 21,905,000. That equaled £ 19.4 million or $ 28,238,277 when it was sold in February 2009, despite the global recession shrinking luxury markets. Relatively small with 61 cm in height and 91 cm width, Fauteuil aux dragons or the Dragon Chair was estimated to fetch only £ 3 million at the auction but the frantic bidding between collectors has pulled it up to six times the estimate and the winner of the unique piece was specialist Paris art gallery Robert and Cheska Vallois. Originally owned by Suzanne Talbot, Grey’s first patron, the chair was auctioned from the collection of famous fashion designer Yves Saint Laurent, who was a fan and collector of Gray’s work. The chair features a sculpted wooden frame, lacquered brownish orange and silver. Two sculptural arm supports are modelled as intertwined bodies of two dragons, whose bodies are decorated in low relief with stylised clouds and eyes are drawn in black lacquer on a white background. The dragon has a history in Chinese iconography as a symbol of strength and goodness, with the power to protect and guard. The dragon is often illustrated toying with a pearl (zhu) which in turn is a symbol of strength associated with the moon and thunder; this ovoid jewel can represent omnipotence or the light of the moon. The entire sculptural form of the present armchair could be interpreted as representing a pearl within its shell, encircled by the dragons. Keep an eye on Mearto for more realized auction prices!